Want to add a little magic to your next event? Then our service for light up letters hire in Essex is an ideal option. Our illuminated letters will add a touch of glamour and sparkle to any event and leave you and your guests wowed. Here at Monitor Lighting, we love light up letters and know you will too. From our base in Essex, we hire a wide range of giant illuminated wedding letters and numbers for use at live festivals, corporate events and parties all over the UK. Our inspiring collection has now grown to include shapes such as hearts and even stars. We also offer a bespoke service and can provide custom built, one off items, specifically to your needs. So whether you want to see your name in lights or are simply looking to add an extra touch of glamour to your next event, we can help you to do it all. Here at Monitor Lighting, we love light up letters and know you will too. From our base in Essex, we hire a wide range of giant light up letters and numbers for use at live festivals, corporate events and weddings all over the UK. Our inspiring collection has now grown to include shapes such as hearts and even stars. We also offer a bespoke service and can provide custom built, one off items, specifically to your needs. So whether you want to see your name in lights or are simply looking to add an extra touch of glamour to your next event, we can help you to do it all. 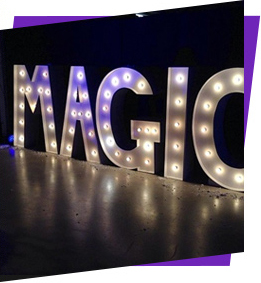 Want to add a little extra magic to your next event? Then our service for light up letters hire in Essex is an ideal option. Our illuminated letters will add touch of glamour and sparkle to any event and leave both you and your guests wowed. Here at Monitor Lighting, we love light up letters and know you will too. From our base in Essex, we hire a wide range of giant light up letters and numbers for use at live festivals, corporate events, and parties all over the UK. 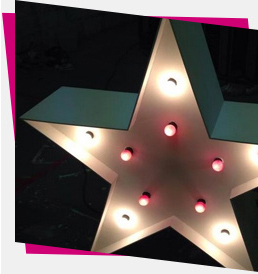 Our inspiring collection of illuminated letters in Essex has now grown to include shapes such as hearts and even stars. We also offer a bespoke service, and can provide custom built, one off items, specifically tailored to your needs. So whether you want to see your name in lights or are simply looking to add an extra touch of glamour to your next event, we can help you to do it all. We also provide wedding letters hire in Essex. Our illuminated letters are a beautifully unique wedding feature and will make your decor sparkle and shine – literally! Light up letters are a fantastic way to make a real statement and add a little personality to your big day. Fun and fabulous, there really isn’t a better way to light up your wedding. At Monitor Lighting, we can provide illuminated letters for hire in Essex, London, and all over the UK. So wherever you are and whatever event you’re planning, we’re here to help. Want to light up your event? Then contact us today to speak to a member of our friendly team.